My thoughts on the law and law school. 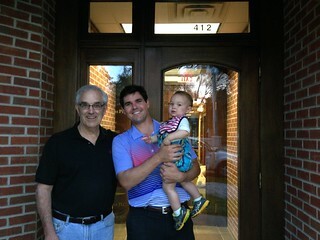 Grandpa, me, and you, Harvey, in front of the back door to the new Kuhn Rogers PLC office. Our prior firm merged with another firm in town, and the rest is history. This move was the result of a long summer of moving and discussing. The end result was an exciting beginning to another chapter of our careers. This entry was posted in Law School, Our Experiences on 22 August, 2014 by Chris. I was hiking Old Mission Point Park with the labradoodle and the husky when I heard that the Illinois bar results were starting to be released, and made my way home to check online. It took a few minutes to read the comments on Above the Law to figure out that ibaby.org was overwhelmed by test-takers checking for their scores. This didn’t surprise me, however I hope that the Illinois bar examiners are able to remedy the problem for next year. It’s not fun receiving an email that tells you your results are up and not being able to login! We are pleased to advise you that you have passed the July 2009 Illinois bar examination. Our records reflect that you have satisfied all of the requirements for admission to the bar of Illinois pursuant to Supreme Court Rule 704 and will be certified to the Illinois Supreme Court as eligible to take the oath of admission. This makes me very happy! Thanks to my family and friends for their support, the Franklin Pierce Law Center for teaching me well over the past three years, and the Starbucks on Halsted Street in Chicago’s Greektown where I spent most of my summer with my blue BarBri books and notecards. This entry was posted in Law School, Our Experiences on 2 October, 2009 by Chris. I’ve been waiting to see The Great Buck Howard since I missed it at Sundance two years ago. It wasn’t the greatest movie (quasi-pun intended), but I liked it well enough. Here’s why. The main character wants to be a writer. I would love to be a writer, but I’m not sure I’m willing to sacrifice the earning potential presented by the legal field. However, considering there are not yet any crops in my legal field, I may be just as well off either way. Hello, Hollywood? That’s really where the similarities end. I wanted “the law” to play a bigger role in the movie, but it wasn’t. Except that “law school” is used as a symbol of oppression from which the main character escaped. I like the message – do what you love … no matter what … and enjoy the journey. This entry was posted in Commentary, Law School and tagged buck howard, colin hanks, law school, Movie, Review, sundance, tom hanks on 27 April, 2009 by Chris. School is as busy as ever, but the end is in sight. I am preparing for a team negotiation in Copyright Licensing. My team is representing a website developer who has been contracted by a small toy company. The essence of the project is to negotiate and come to an agreement on the controlling contract. My final Judicial Opinion Drafting order is due one week from yesterday. I am writing as the Supreme Court of New Hampshire deciding whether the Superior Court erred in affirming a Department of Labor decision to award wages and liquidated damages to a peeved former employee who was denied her previous-year’s bonus when she left her job as an insurance agent with a small family insurance company for a larger insurance company. I’ll spend the weekend doing this, but at least I’ll be mostly done with one of my five classes. Nothing much else notable regarding school work. Four of five of my classes have take-home finals. Most of my exam weeks will be spent writing documents from home, which should be less stressful than the typical “cram-dump” exam routine. Barrister’s Ball is this weekend. I didn’t get tickets, and the only ones available are going for 100 to 200% above face value. It would be fun to go, but partaking in law-prom ranks quite low for me. Putting all of the work in perspective is my anticipation of The Masters broadcast this weekend. This is by far my favorite golf tournament of the year to watch on TV. I’m hoping Tiger Woods makes a run for the green jacket, but that the contest is close. Who do you think will win? This entry was posted in Golf, Law School and tagged classes, Golf, law school, pga tour, spring semester, the masters, tiger woods on 7 April, 2009 by Chris.